Remember that there are four rotator cuff muscles and this month we’re doing numbers two and three. I have put these two muscles together for this month’s ‘muscle of the month’ series based on their action (external rotation). 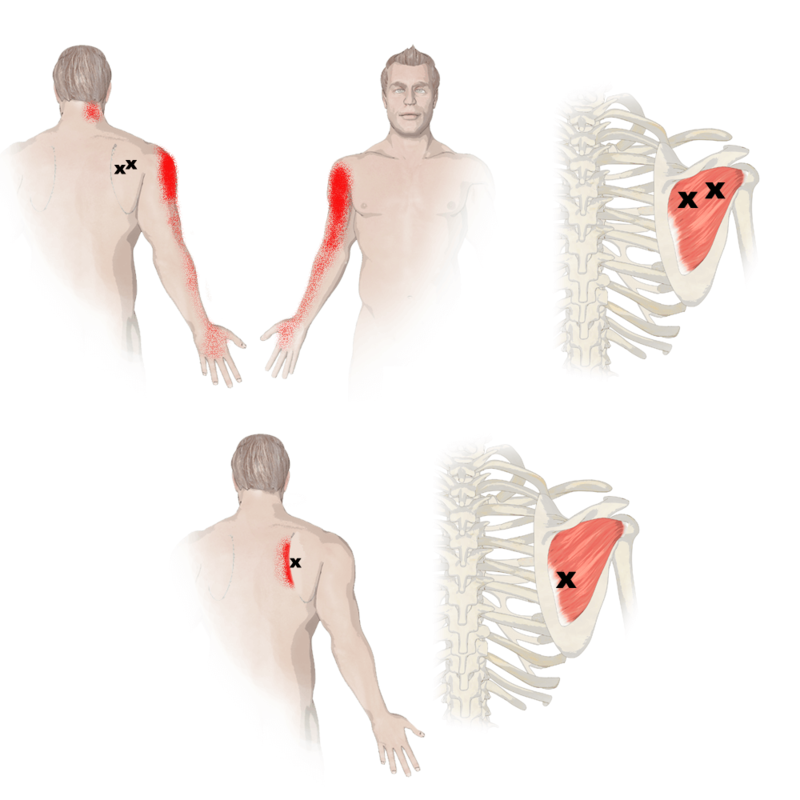 The first rotator cuff muscle was the supraspinatus muscle last month. 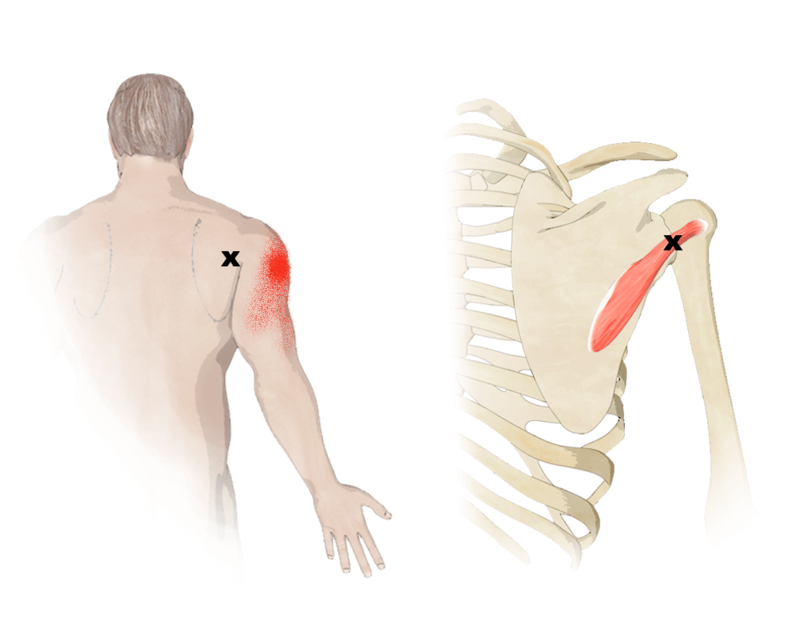 Next month we’ll wrap it up with the subscapularis. Its name describes its location (below the spine). Infra means below or underneath and spina refers to a spine in this case referring to the spine or ridge of the scapula. What does teres minor mean? Teres means rounded and minor refers to the fact that it is the smaller of the two “teres” muscles. 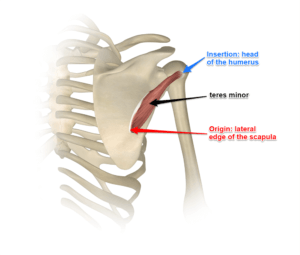 (Teres major is not one of the muscles of the rotator cuff). Where do infraspinatus and teres minor attach? Infraspinatus originates on the infraspinous fossa on the scapula and covers the lower two-thirds of the scapula. Teres minor originates on the middle portion of the lateral edge of the scapula. Both infraspinatus and teres minor attach on the head of the humerus. Infraspinatus may be partially or totally fused with teres minor in some people. 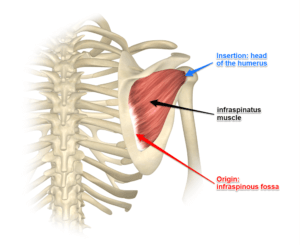 What actions do infraspinatus and teres minor do? Both infraspinatus and teres minor are external rotators of the humerus at the shoulder joint. All rotator cuff muscles help to stabilize the head of the humerus. What are the most common injuries to infraspinatus and teres minor? Infraspinatus is the second most likely of the rotator cuff muscles to get injured after the supraspinatus. A tear of the infraspinatus could be the result of either an acute or chronic movement. Baseball pitchers classically tear the infraspinatus muscle. It’s not the acceleration of throwing the ball as much as it is the eccentric control of this muscle while they are throwing the ball that causes it to tear. By far, the most common issue I see in yogis is the development of trigger points in these muscle. This is especially true of practitioners that are regularly doing chaturanga, up-dog, and down dog. The shoulder has to stabilize through these movements and that is the job of the rotator cuff muscles in general. Look at the trigger point patterns and you will see that the referral pattern is similar to what many people complain about in yoga. In Marichyasana C, the infraspinatus and teres minor are being lengthened due to the internal rotation of the right shoulder. Trying to get the arms into eagle pose (external rotation of the shoulder) will cause both of these muscles to contract. So what postures can strengthen these muscles? Other than Garudasana? Is it wise to do Marichy if there is a tear or strain or instability? Thank you for this, I found it so useful as I have struggled with a weakness/imbalance in one of my shoulders for 20 years. I did not do anything to get a chronic injury, Im not really sure what happened, I just know my left side is weaker and fatigues easily. Interestingly the trigger line down the outside f the arm is exactly where I get my discomfort at times, in particular during down dog, I feel this into my little finger. I also feel it at other times, even when not during exercise, It can be after I have had some remedial work done. It is great to see some other postures I can be doing to help with this though. I’ve found that the best way to strengthen all the rotator cuff muscles is to continue doing a series of shoulder rehab exercises a Physical Therapist gave to me about year ago. I use light weight dumbbells and stretch bands/tubes. I’m even building a narrow stall bar (looks like a ladder) so I can do the exercises without any prep.